Question: "What was/is the importance of the gates of Jerusalem?" Answer: The gates of ancient cities were important as a means of providing access to the city while maintaining security. The Bible speaks of the gates of Jerusalem many times in many different contexts. As the city walls are built, destroyed, and moved and the gates are bricked up, restored, or renamed, it can be difficult to figure out what gate the text is talking about. To add to the confusion, some of the gates mentioned appear to be not in the outer wall but in the wall providing access to the king’s palace. The wall around Jerusalem before the Babylonian exile was probably close to the one that Nehemiah rebuilt. It roughly encompassed the Temple Mount to the north and trailed to the south to include the Pool of Siloam. It’s especially difficult to determine where the pre-exilic gates were in relation to modern Jerusalem. Corner Gate: Location uncertain, although apparently on the northwest corner of the wall. It was destroyed by King Jehoash of Israel (2 Kings 14:13; 2 Chronicles 25:23) and later rebuilt by King Uzziah (2 Chronicles 26:9). Jeremiah 31:38 says the Corner Gate will be rebuilt, and Zechariah 14:10 mentions it during a prophecy about the Day of the Lord. Ephraim Gate: On the north wall, toward Ephraim. Second Kings 14:13 and 2 Chronicles 25:23 say it was near the Corner Gate. The Ephraim Gate isn’t mentioned in Nehemiah’s tour of the walls in Nehemiah 3, but it is mentioned during the Feast of Booths (Nehemiah 8:16) and the dedication of the wall (Nehemiah 12:39). The latter passage puts it in series with the Old Gate, the Fish Gate, and the Sheep Gate. Foundation Gate: This gate is mentioned during the coronation of King Joash (2 Chronicles 23:5) The parallel passage of 2 Kings 11:6 calls it the Sur Gate. Jeremiah called it the Middle Gate and said it was where the Babylonian officials came and waited for King Zedekiah to declare defeat (Jeremiah 39:3). The Foundation Gate is apparently an interior gate in or leading to the king’s residence. It’s unclear if it is the same as the Horse Gate in 2 Kings 11:16. Benjamin Gate: Probably the same location as the later Muster Gate or possibly the Sheep Gate. Jeremiah was put into stocks at the Benjamin Gate after Pashhur the priest beat him (Jeremiah 20:2). New Gate: Jeremiah was put before an inquiry at the “the entrance of the New Gate of the LORD’s house,” which was apparently in the courtyard of the temple (Jeremiah 26:10; 36:10). Sheep Gate (AKA Benjamin Gate? ): North central, just north of the Temple Mount. Near where the sheep market was for the temple sacrifices. The priests rebuilt and dedicated it (Nehemiah 3:1). Possibly the entrance from the road to Jericho. It may be the same Sheep Gate of John 5:2 near the Pool of Bethesda, but that identification is unclear. Fish Gate (AKA Ephraim Gate): Northwest, just northwest of the temple. The main entrance for fish mongers from the Mediterranean Sea and the Sea of Galilee. The Fish Gate was one of Jerusalem’s main entrances. King Manasseh had built it after God sent the Assyrians to capture him and teach him humility (2 Chronicles 33:14). Nehemiah had the sons of Hassenaah rebuild it (Nehemiah 3:3). Zephaniah prophesied that a cry will come from the Fish Gate on the Day of the Lord (Zephaniah 1:10). Old Gate (AKA Gate of Yeshanah/Jeshanah, which means “of the old” or possibly “the gate of the new quarter”): The location of this gate is uncertain. Nehemiah 3:6 suggests it is near the northwest corner of the wall, west of the Fish Gate. Valley Gate: West central, south of the present wall of Old City. The gate that Nehemiah used when he did his inspection of the walls (Nehemiah 2:13, 15). Dung Gate (AKA Potsherd Gate? ): Very southern tip, facing southwest. There was a walled section around the Pool of Shelah (or Siloam, John 9:6–7), then the Dung Gate (Nehemiah 3:13–14) exited out to a garbage dump in the Hinnom Valley where, in the days of King Manasseh, child sacrifices took place (2 Chronicles 33:6). One of two great choirs went to the Dung Gate during the dedication of the wall (Nehemiah 12:31). Fountain Gate: Southern tip, facing east. The east gate that led out from the Pool of Shelah to the king’s gardens and the stairs that went down the eastern slope (Nehemiah 3:15; 12:37). 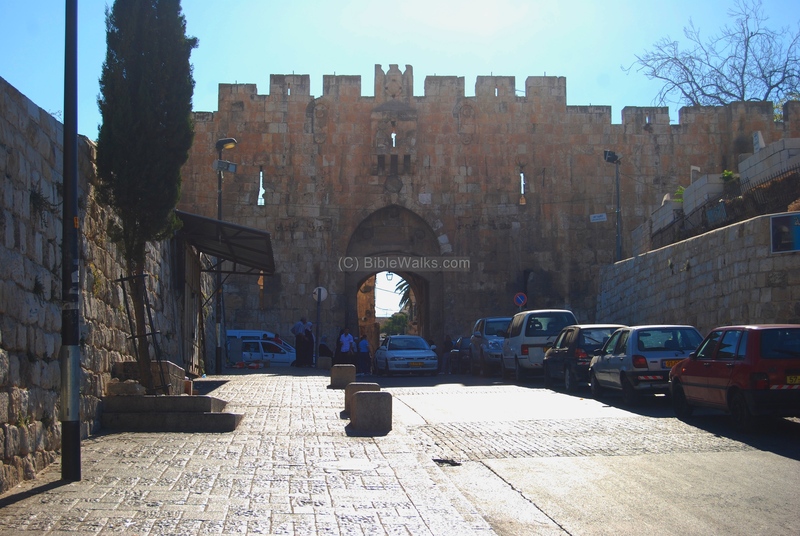 Water Gate: Facing east, south of the current Old City walls (Nehemiah 3:26). It is near the start of the tunneled waterway that was fed by a spring—possibly En-Rogel (Joshua 15:7; 18:16) or Gihon (2 Chronicles 32:30; 33:14). The eastern wall on the south end apparently was abandoned and a new wall built farther west, turning the southern section into more of a tail. The new wall excluded the tomb of David and most of the water tunnel that fed the Pool of Shelah by the Dung Gate. But the narrow confines included the upper house of the king, the home of the high priest, and the ascent to the armory. After the wall was built, Ezra read the people the Law from a square by the Water Gate (Nehemiah 8:1). Horse Gate: East side, just east of the royal palace and southeast of the Temple Mount. Near where the priests had their homes (Nehemiah 3:28). Not the same “horse gate” of 2 Kings 11:16 and 2 Chronicles 23:15; that gate was between the palace and the temple and was the site where Queen Athaliah was killed. East Gate (AKA Golden Gate or Temple Gate): Just north of the Horse Gate, it led to the temple. Around 600 BC, Ezekiel prophesied that a “gate facing east” would be sealed (Ezekiel 44:1–3), but this is not the same East Gate mentioned by Nehemiah. Muster Gate (AKA Inspection Gate; Benjamin Gate? ): Between the East Gate and the northeast corner of the wall. Possibly the same as the Benjamin Gate (Jeremiah 20:2) where Jeremiah was imprisoned in stocks. The wall around Jerusalem during the time of the New Testament was probably the biggest that ever existed. Because of that, these gates are even more difficult to locate. Essene Gate: The Essene Gate was on the wall that existed in Jesus’ time, south and a bit west of the present-day Zion Gate. Appropriately enough, it was the gate through the wall that led to the Essene section of the city. This south wall was mentioned by Josephus but was destroyed by the Romans in AD 70 and never rebuilt. Beautiful Gate (AKA Nicanor Gate): An entrance to the temple courtyard built by Herod the Great of polished bronze. The place where Peter and John healed a lame man (Acts 3:10). Note, this is not a gate in the city walls. East Gate (AKA Beautiful Gate or Golden Gate): Jesus apparently entered this gate on Palm Sunday before He drove out the merchants in the temple courtyard (Matthew 21:12–17). East Gate: In AD 1530 Ottoman Turks walled up the East Gate because of a Jewish tradition that states the Messiah will pass through the Eastern Gate when He comes to rule. The walling-up of the East Gate was a Muslim attempt to keep out the Jewish Messiah. Lion’s Gate (AKA St. Stephen’s Gate): The deacon Stephen was supposedly killed in the Kidron Valley, below. In the 16th century, the Turkish sultan dreamed he was being attacked by lions. An interpreter told him they represented the lions that guarded the thrones of David and Solomon and the dream meant that, if he treated Jerusalem with respect, he would be blessed. The sultan went to Jerusalem and saw the walls were in ruins. So he rebuilt the wall, including this gate—which appears to be guarded by relief carvings of leopards, not lions. Herod’s Gate (AKA Flowers Gate): Near the east corner of the north wall. Right outside the gate is a cemetery. No one wanted to live in an area known for a cemetery, so they changed the Arabic for “cemetery”—Sahirah—to Zahirah, which means “flowers.” Although it’s also known as “Herod’s Gate,” there was no gate there when Herod the Great was king, although Herod Antipas had a home nearby. 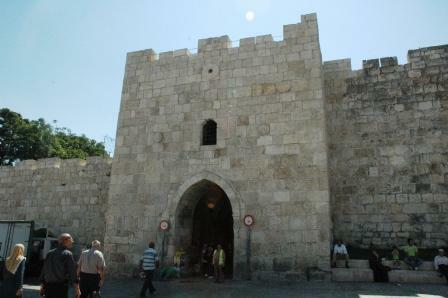 Damascus Gate: The center of the north wall. The busiest gate on weekends as shoppers come into Jerusalem. New Gate: The northwest corner of the Old City. The current New Gate was made in 1887 when Christians demanded the Turkish sultan give them direct access to their quarter of the city. Jaffa Gate: The center of the western wall, near where Herod’s palace was. Currently, one of the main gates into Jerusalem. Zion Gate: Near the west corner of the southern wall. Connects King David’s tomb and the Upper Room to the Jewish Quarter of the Old City. 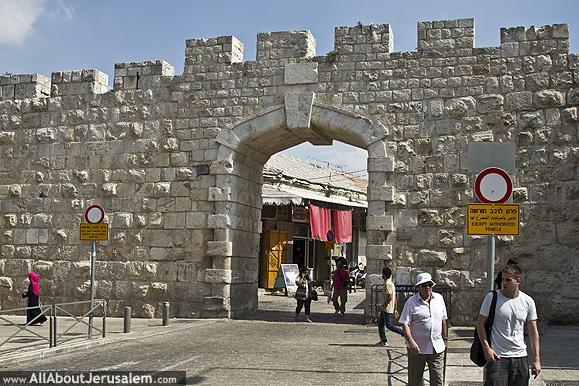 Tanners Gate: Although Tanners Gate dates to medieval times, it was only reopened during the 1990s to alleviate pedestrian traffic that came through the newer Dung Gate to get to the Wailing Wall. Dung Gate: Apparently not the original Dung Gate; this is farther north, as the “tail” of Nehemiah’s Jerusalem was cut off. Tribal Gates: Ezekiel 48:30–35 and Revelation 21:9–27 describe the New Jerusalem. The heavenly city will have three gates on each side—one gate for each of the tribes of Israel. While the walls are built and decorated with jewels, each gate will be made of a single pearl, and each will be guarded by an angel.